After Mr. van der Hout finished his MSc. study in Marine Technology, he worked during one year as Researcher at the faculty of Ship Hydromechanics. 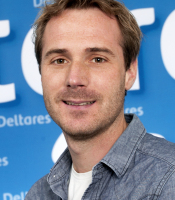 He joined Deltares as a staff member of the Harbour and Offshore Technology section. He works on hydrodynamic topics related to nautical activities in and around harbours and hydraulic structures, including ship manoeuvring and moored-ship studies. He is involved in R&D projects regarding low-frequency waves, passing ships, ship manoeuvring in stratified flows, and in the development and testing of several hydraulic mathematical models. Project leader of the scale model work for the new sealock in Ijmuiden. This includes designing the scale model facility, supervising the building process and carrying out measurements. Computing geometry dependent forces on a vessel entering a lock and coupling these forces interactively with a real time manoeuvring simulator. Research On Passing Effects on Ships. JIP Ropes, Joint Industry Project, Research On Passing Effects on Ships. Cooperation with Pinkster Marine Hydrodynamics (PMH BV), Svašek Hydraulics, and MARIN. Study of the effects of passing vessels on moored vessels inside ports or along a channel. Aim: to improve insight into the effects of passing vessels and to develop methodologies for the evaluation of such effects. The study is funded by several international organisations, including port authorities, terminal operators, consultancy firms, and engineering firms. Wave model study to determine wave propagation over a generic dredged entrance channel using a Boussinesq-type wave model. JIP HAWA-II, Joint Industry Project, sHallow WAter Initiative, Part 2. Cooperation with MARIN (Netherlands),Bureau Veritas (France) and Shell (Netherlands/UK). Study of the characteristics of waves in shallow water for the design and development of offshore (LNG) terminals. Aim: to develop a complete design approach for nautical facilities in shallow water for low-frequency waves. The study is funded by several international companies from the oil and gas industry. Research project on the nautical safety for a new lock design. Application of CFD (OpenFOAM) to simulate the forces on ships entering a lock due to density currents. Evaluation of a port entrance channel and derivation of weather windows indicating limiting wave and tidal conditions. Supervisor of several MSc students from TU Delft and IHE. Subjects e.g. : Wave penetration and moored vessel response, Directional wave splitting of low-frequency waves, Effectiveness of floating breakwaters. A.J. van der Hout an M.P.C. de Jong, 33rd PIANC World Congress, San Francisco, USA, 1-5 June, 2014. Hout, A van der, Borsboom, M., 2009, International Multi-Purpose Reef Conference (IMPR2009), Jeffrey’s Bay, South Africa.